The proposal to build a new apartment building at 760 Broadway completed its unusual return trip to the planning board with a unanimous 5-0 vote to approve its major development plan (with a few technical conditions). 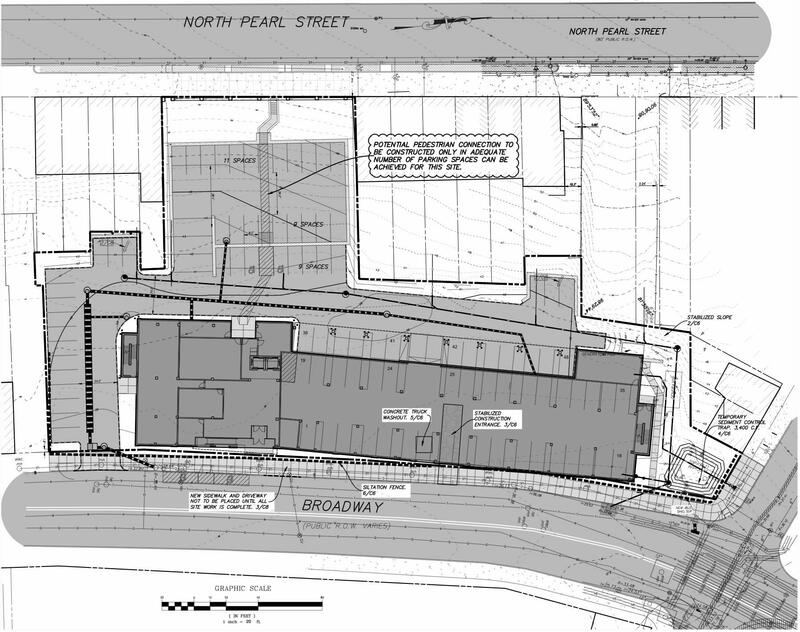 Fairbank Properties -- the developers behind the Arcade Building and 27 Western conversions -- had originally proposed to build 100 units on the site that spans from Broadway to North Pearl. All the approvals and whatnot were in place, work started, and... it turned out there were some unmapped sewer lines that caused complications for the design. So the developers redesigned with a smaller building footprint and 88 units (72 studio and 1BR / 16 2BR), with parking for roughly 110 cars (much of it situated underneath the building and heated). There wasn't much discussion from the board because the project has been up multiple times before, though the board did again touch on the issue of providing some sort of interesting treatment for the street level windows along the parking garage. But there was a late twist during public comments: Two property owners from North Pearl spoke to raise their concerns about losing access to the rear of their properties, something they apparently had enjoyed while the site had been a parking lot. Fairbank's David Sarraf said the current building design wouldn't physically prevent that, and it could be possible to work out some sort of arrangement to put gates in the fence along the property line. Board chair Al DeSalvo noted that a lack of alleys in Albany does sometimes complicate things, but he also pointed to multiple neighborhoods -- such as Center Square and Hudson/Park -- that have similar row housing with limited access to back yards and the long track record of those properties. The 760 Broadway project is notable for a few reasons. One, it continues the ongoing residential boomlet downtown. Two, it's a new-construction project when many recent residential projects have been conversions. And three, that section of the city -- between downtown proper, Arbor Hill, and the Warehouse District -- is in line to change dramatically in the next few years with this project and the Quackenbush Center mixed-use project. Rehabilitation Support Services, Inc's bid to knock down a decaying old school building in West Hill and construct three new residences for people with substance abuse and addiction issues got a 5-0 vote on all three approvals it needed to move forward (earlier). This project is the culmination of a multi-year process that included a legal fight with the city. There was little discussion from the board because the project had been up before multiple times and was waiting on a few final technical reviews. There were two public comments. Charles Robinson of Lexington Ave delivered an impassioned speech about his frustration with a lack of jobs for people in the neighborhood and called for the project to hire people from the neighborhood. And Joe McGovern, who said he owns multiple properties in the neighborhood, spoke in favor of the project. 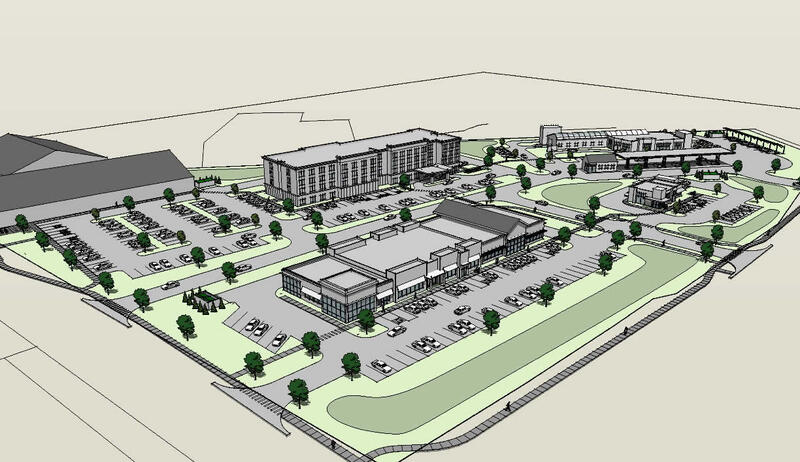 An LLC called 351 Diamond Development has proposed building a hotel, retail stores, restaurants, gas station and car wash on the former Howard Johnson's / tennis club property on Southern Blvd at Mt. Hope Drive. A new roadway through the site will connect Mt. Hope to Southern. The planning board unanimously voted in favor of the approvals needed for the project, including the district plan, with a handful of technical conditions (among them that the new roadway be open to the public). There wasn't much discussion from the board because the project had been up multiple times. Tony Stellato of CHA provided a short update on some technical issues, including a plan to build a new water line that could provide some redundancy in the area, which has suffered from water main breaks. The one public comment was from former Common Council member Dominic Calsolaro, who was speaking on behalf of Common Council member Dorcey Applyrs. Calsolaro said Applyrs had no problem with the plan and was happy to see it move forward. By the way: One of the retail buildings includes a drive-thru / parking setup that suggests a Sonic might be in the works. Cardona Development Group is proposing to knock down an existing single-family home and build a new 2-story, 24-unit apartment building with garage buildings in the Pine Bush off Rapp Road and Washington Ave Extension. You might remember this project was the subject of pushback from condo owners in developments along Pine Lane who argued the street was already unsafe because it's too narrow, not lighted, and suffered from speeding. They said that adding more residents -- and traffic -- would make things worse. Daniel Hershberg, of Hershberg and Hershberg, was back representing the project and presented highlights from a traffic study which projected that the new apartments would increase the peak hourly number of vehicles on the street to 51 from the current 44. There were three public comments -- from Lawrence D'Arco, president of the board of directors of the Village in the Green Condominiums; Tim Jennings, owner of a condo adjacent to the project site; and Common Council member Michael O'Brien. All three raised the issue of safety on the street and cautioned against the new project. It appeared the board was ready to vote, but city assistant corporation counsel Marisa Franchini requested that the board hold off so that the parties could discus some of the issues. One of the quirks here is that the city doesn't own Pine Lane, a situation with roots that stretch back decades. The parcel lines for the properties along it run down the middle of the street, so any improvements -- such as widening the street or adding sidewalks -- would be at the discretion of each property owner along the street. Even so, the city does pave and plow the street. So... maybe this project is the prompt for the the city and property owners to untangle the situation and set up something more standard. 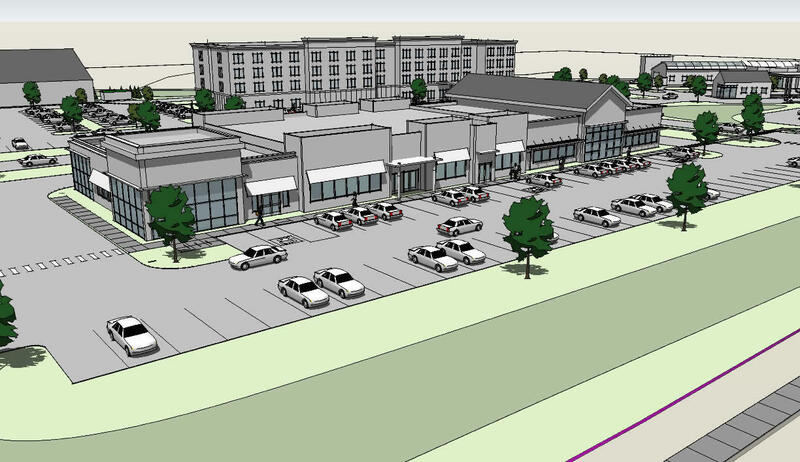 Regan Development is proposing to build a 5-story, mixed-use building with retail, offices, and 74 apartments on the site of demolished old Albany Police Department building on Central Ave near Manning Blvd. Jamie Easton of MJ Engineering was back for an update on the plan. The biggest change: The addition of a right-only exit driveway through a strip of land out to Manning Boulevard. Easton said a traffic report prepared by Creighton Manning indicated that having that option would be safer than having drivers turn both right and left from a driveway onto Central Ave. The driveway would also allow easier access for the fire department. During public comments, Common Council member Alfredo Balarin said neighborhood residents were concerned about the driveway to Manning, and were more comfortable with an earlier version that didn't include it. He said residents are concerned people will use the property and driveway to cut the corner at Central and Manning. (Al DeSalvo appeared to be skeptical cut-throughs would become a large problem.) And he noted that the Stewart's there seems to get along OK with only allowing right turns from its parking lot onto Central. Balarin said neighbors aren't afraid of change, but they do want to the protect the neighborhood -- and they're willing to compromise. One possibility mentioned by both Easton and Balarin was a gate on the driveway to Manning that would restrict people from misusing the drive. So maybe that's a potential compromise. The other public comment was from Renee Cowan, CEO of the Albany Firemen's Federal Credit Union. It owns the adjacent property to the north, and she noted concerns about shadows and falling snow from the 5-story building onto the walkway to the credit union's entrance. She requested that the new building provide lighting. And Easton provided follow up noting that the new building would have a flat roof and internal drainage. Cowan also said the credit union was open to the possibility of Regan Development acquiring their land in exchange for a lease in the new building. Easton said he didn't think that was something the developer was interested in. 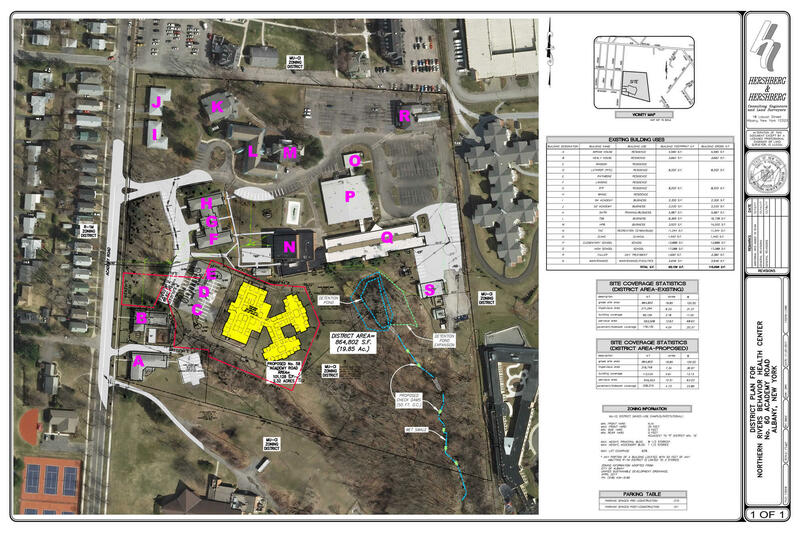 Northern Rivers / Parsons Child and Family Center is proposing to build a new 25,674-square-foot office and residential building on its Academy Road campus and then knock down a building it would no longer be using. This was the project's first time up before the board. Daniel Hershberg, repping the org, walked through the overview. There wasn't a lot of discussion with the board, and what there was mostly focused on the routing of truck traffic through a new drive to Academy. Hershberg also pointed to a large retaining pond already on site and the addition of a "wet swale" to handle drainage issues. And he talked a little bit about trees that would be used for screening between the building and Academy Road. For zoning nerds: If approved, this project would cover the entire Parson campus under a new district plan laid out in Albany's new zoning (pdf p. 251). The marathon planning board meeting concluded with a presentation for a plan from Red-Kap Sales to partially demolish and a rebuild the gas station on the north side of the Southern Blvd / Mt. Hope Drive intersection. This was the first time up before the board. Engineer Frank Herba explained that gas pumps and canopy would stay and the service building would be demolished for a new building that could incorporate a Dunkin' Donuts with a drive-thru. The plan also includes the addition of a single-car car wash. There wasn't a lot of discussion with the board. The focus was mainly on the addition of new sidewalks and how they'd be routed. I really enjoy this thorough coverage of the planning board meetings. Thank you very much for it. Thanks for keeping us in the loop. This is so cool and useful! I always tune-in for Tales of the Albany Planning Board. Guaranteed entertainment. Thanks for the reporting, as always. I really appreciate these write-ups. This helps to keep in track of what projects are going in around the city.